Alhamdulillaah, I am quite pleased with the following HDR image I was able to assemble. While not as good as the best that are out there, it is definitely a step-up from my other attempt I shared here. The workflow this time was almost the same as always, with one minor difference. I took several shots of the same scene at different exposure levels (1/3 EV), amounting to a whopping 28 (!) separate exposures, which is about the most I’ve ever done. I renamed the images so that they were in sequence from darkest to lightest, which helps with the next step, which is to align them using Hugin‘s separately-packaged align_image_stack. However, instead of using the align_image_stack utility directly, I called it from within Qtpfsgui (using the –align switch on the command line). 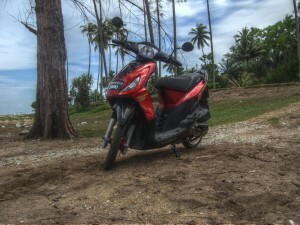 I used the default HDR generation settings and output to OpenEXR format. The difference is that I did the HDR generation from within Qtpfsgui rather than using align_image_stack’s own routine (which also outputs in, I believe, Radiance HDR format). Comparing the two, I realized that there wasn’t much difference at first, but at a closer zoom (e.g., 1:1), the Qtpfsgui method has far less noise in some areas (but not without some glitches, maybe you can find them), resulting in a smoother & more-natural picture. I may consider playing with more than just the default HDR parameters with Qtpfsgui for generating the HDR image to see what other results I can get. The final phase is tonemapping, which I generally don’t tweak. Contrary to previous attempts, the Mantiuk algorithm produced a very colorful image, which I usually can only get with Fattal, which brings with it some other complications. All in all, it was great. If I had to guess, I would say that part of the reason for the ease of working with this HDR sequence was that the image had plenty of HDRness available to play with – the sky, the ground, the scooter with its reflective highlights as well as its darker spots. Next Post - Next post: It’s a boy!